Introducing Cabot’s Dante Inferno, a journey of betrayal and treachery embodied in steel, an evocative blend of beauty, craftsmanship, and artistic significance. 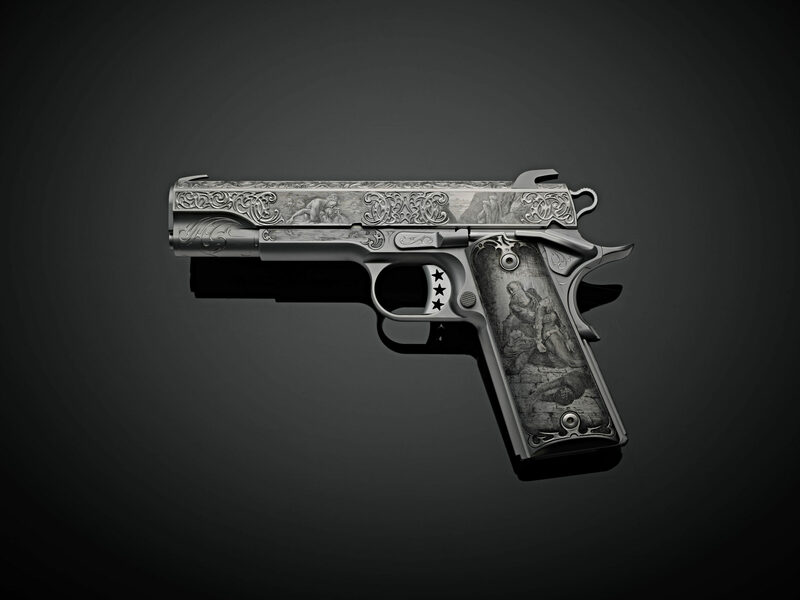 Voted by the FEGA Master Engravers as Handgun of the Year, the Dante is a unique creation engraved with three cantos from this mesmeric epic, penned by the poet Dante Alighieri more than 700 years ago. Love and betrayal combined with treachery and vengeance form the focus of Cabot’s Dante Inferno pistol; represented in the circles of Hell occupied by the shades of Francesca and Paolo, and those of Ugolino and Ruggieri. As Inferno begins, Dante finds himself lost in a dark wood (selva oscura), searching for a way forward and nearly at the precipice of Inferno. Griffith’s engraving, modeled on the original illustration by Gustave Doré captures this moment, depicting Dante along the top of the slide. At high magnification the surreal expression on his face is the first glimpse into the level of detail on this masterpiece. The precise image of Dante surrounded by grasping branches naturally leads one’s eye to the deep reverse scroll engraving that not only adorns the slide beautifully, but also appears to surround Dante and become the very tendrils that seek to ensnare him. On the rearmost portions of the right- and left-hand sides of the slide are mirror image engravings of Dante and the shade (ghost) of Virgil. The shade becomes Dante’s companion, comforter, and guide as he descends to the very depths of Inferno. These two images—one by Doré and its mirror created by Griffiths—depict Dante and Virgil prior to their passage through the Gates of Hell. 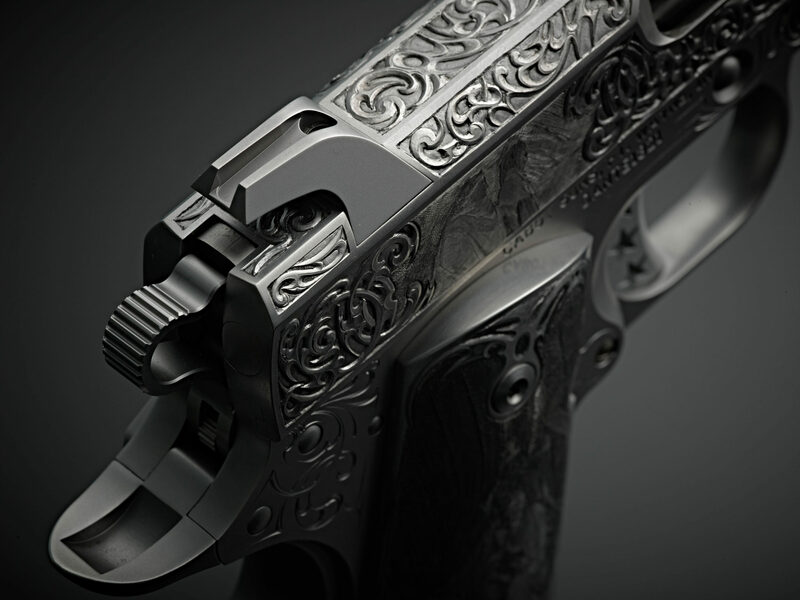 From here, each side of the pistol is dedicated to one of two Inferno cantos. 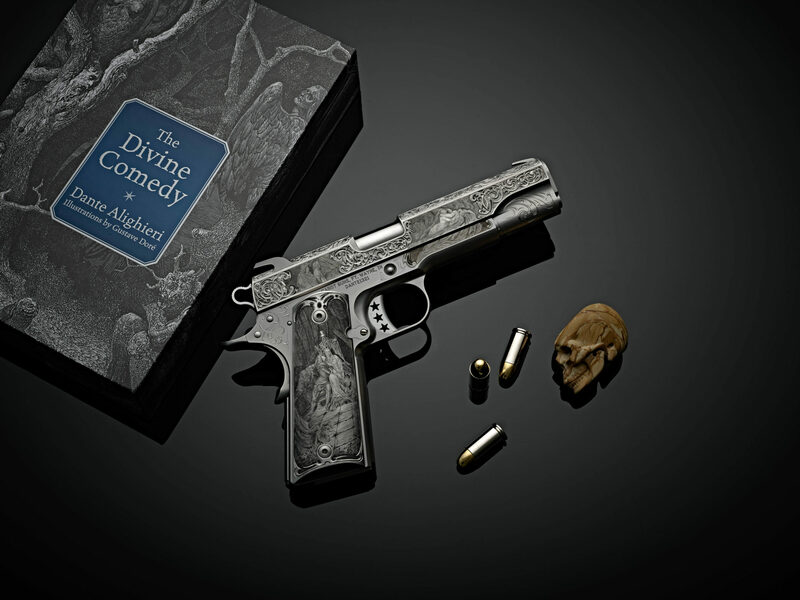 On the right side of the Cabot Dante Inferno pistol are two engravings that form a sort of before and after collage or, in Dante’s view, a spiritual cause and effect. The right-hand grip portrays Francesca da Rimini and her lover, Paolo. From the shadows creeps Francesca’s less-than-comely husband, Gianciotto, who was also Paolo’s older brother. As Griffith’s expert rendering reveals, Paolo and Francesca are overcome with passion while reading Lancelot du Lac—a steamy recounting of Lancelot and Guinevere’s romance. The lovers are caught in flagrante delicto by Gianciotto. The enraged husband runs Francesca through as she shields her lover. Not to be denied, Gianciotto finishes the deed and slays Paolo as well. As one’s eyes move forward along the Cabot Dante Inferno slide and frame, see how it illustrates the lovers’ fate. Consigned to the second circle of Hell upon their demise, the shades of Francesca and Paolo are locked in an eternal embrace, forever repeating their sin and thus, never able to escape. Dante calls to them and hears the tale of lust and murder directly from Francesca’s lips, while Paolo weeps endlessly. Terrible as the lovers’ fate may seem, it is mild to that which is portrayed on the left side of the Cabot Dante. On the grip, the treasonous Count Ugolino of Donoratico—an Italian nobleman, politician, and naval commander—is portrayed in prison with his sons. Why? The Archbishop Ruggieri, whom Ugolino trusted, betrayed the count and sentenced both he and his young sons to starvation. And if thou weep’st not, what could make thee weep? Portrayed in memorable detail on the left side of the Cabot Dante’s slide and frame is Ugolino’s eternal hatred for Ruggieri and, reflected in his equally eternal damnation with perhaps Inferno’s most visceral scene: Ugolino gnawing on the back of the Archbishop’s head forevermore. In a twist of punishing irony, the victim of betrayal—himself a traitor—who died from starvation is destined to dine on the flesh of his betrayer for all eternity. Faithfully captured on Cabot Dante is the depth, emotion, and detail written by Dante and illustrated by Doré. 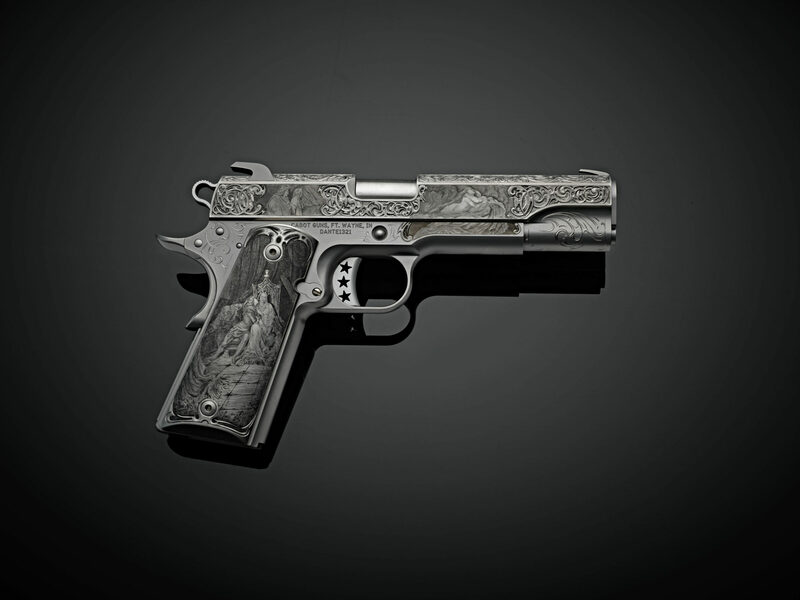 Griffiths’ sculpting techniques, including bulino and intricate scroll and ornamental styles, render the Cabot Dante 1911 pistol a master work of art, worthy of esteem in any museum.